As I discussed in my recent post, there are two adults-only restaurants about the Disney Cruise Line Dream Class ships, but one of those two is also found on the smaller Classic Ships. 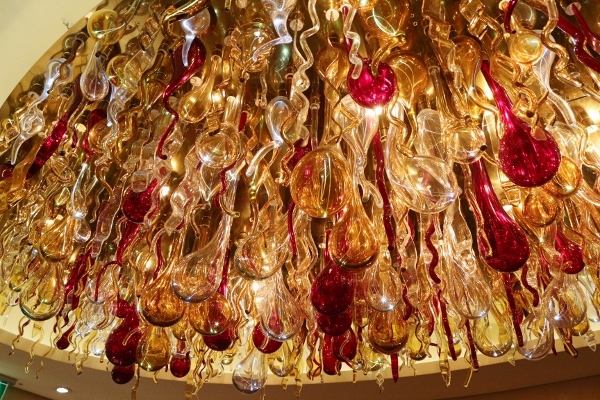 Palo, meaning "pole" in Italian, is inspired by Venice, its name referring to the tools of the trade of Venetian gondoliers. 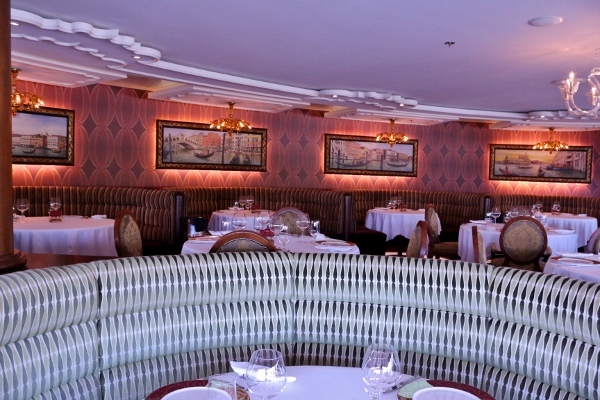 Palo features an outstanding brunch option on sea days, but it is also known for its fantastic dinners. 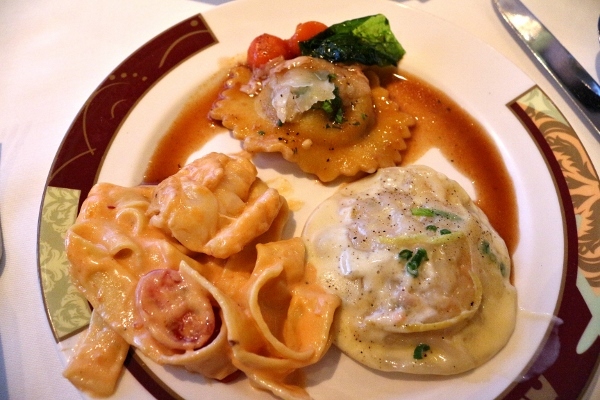 Prior to my recent Disney Cruise, I had only eaten dinner once at Palo, but frequented the brunch on nearly every cruise I've sailed. 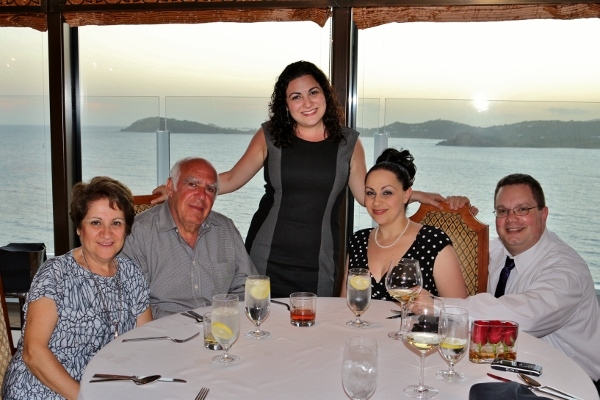 It was time to remedy that as we sailed out to sea from the beautiful port of St. Thomas. Previously, I've only dined at Palo on sea days, so this was the first time I got to enjoy a view other than the gorgeous ocean. We were seated when it was still daylight, and as the sun began to set we sailed away, watching the lush landscape fade into the distance. It was actually really cool, and I'd definitely recommend dinner at Palo or Remy on a day and time when you can actually have a view leaving the port. Brunch and dinner at Palo are both currently $30. Either meal is totally worth the added price tag. 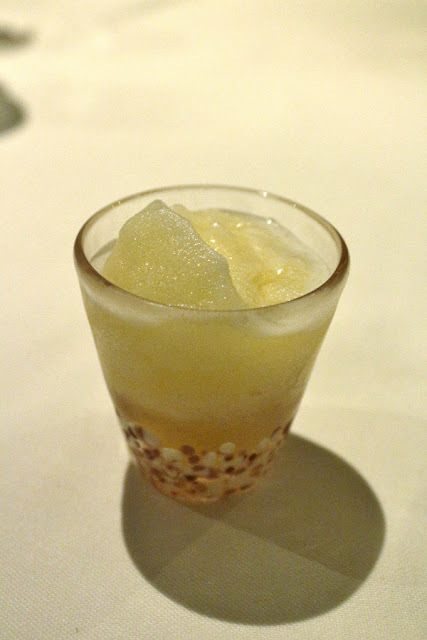 While the food in the rotational dining rooms is generally quite good, the food at Palo is excellent, as is the entire experience. Our authentically Italian server, Ali (short for Alessandro, from Sicily!) almost felt like a part of the family by the time we completed our meal. 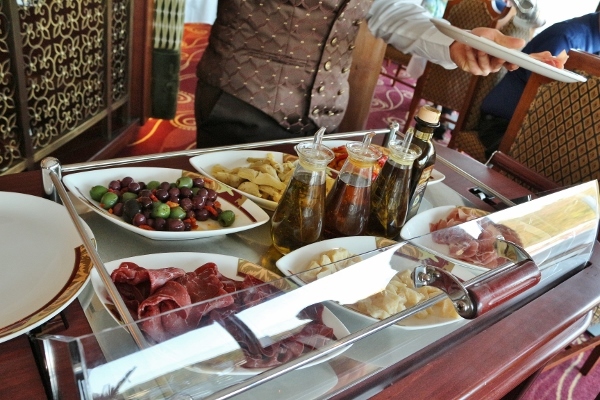 Dinner at Palo begins with the highly anticipated antipasti cart. 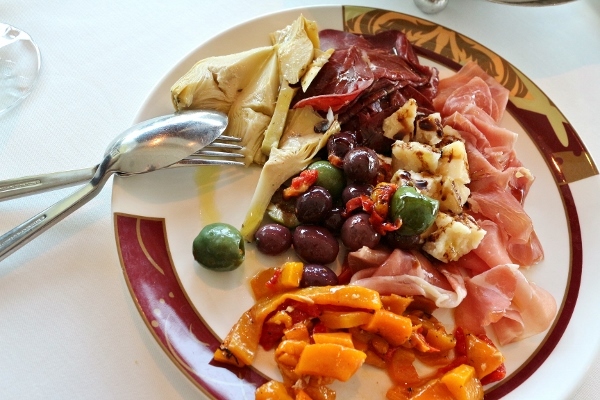 Ali plated prosciutto, bresaola, Parmigiano-Reggiano (aged 12 months), marinated olives, artichokes, and roasted bell peppers all drizzled with your choice of infused extra-virgin olive oil (either thyme, chili, or rosemary) and balsamic vinegar (aged 8 years). 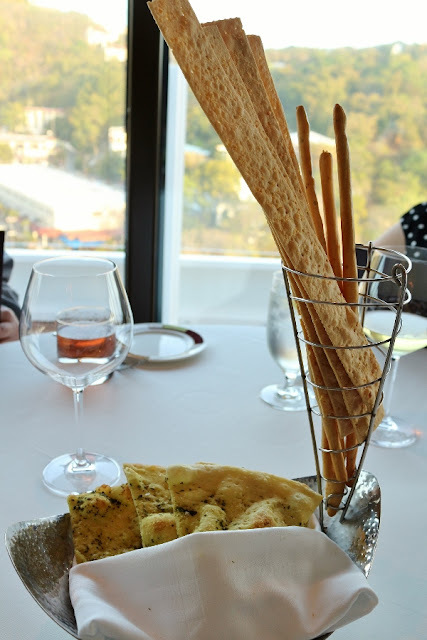 We also have three different breads to choose from, including grissini, crisp crackers with Parmigiano, and herbed flatbread made in Palo's pizza oven. You can order as little or as much food as you'd like, but we do try not to go overboard (figuratively and literally--I just made a cruise pun! haha). Sharing is also encouraged. 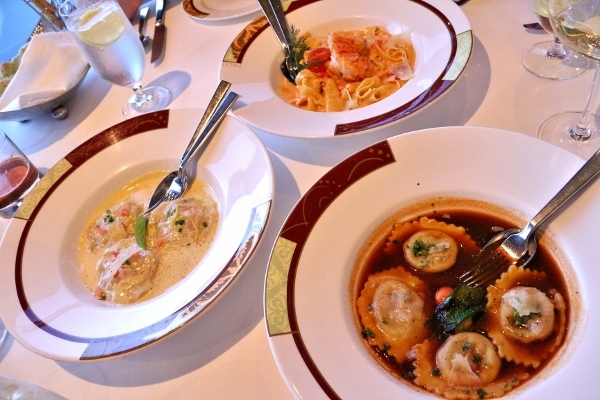 Each of us selected either a starter or a soup to begin our meal, followed by several pastas for sharing, and then an entree and dessert for each of us. 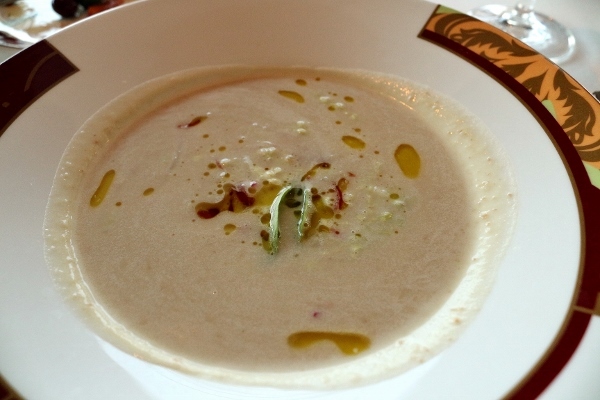 I selected the Tuscan white bean soup with prosciutto and Parmigiano, garnished with cabbage and red radishes. The soup is velvety and incredibly flavorful. I'm a big fan of pureed bean soups, but rarely have the privilege to eat them. This soup definitely satisfies. 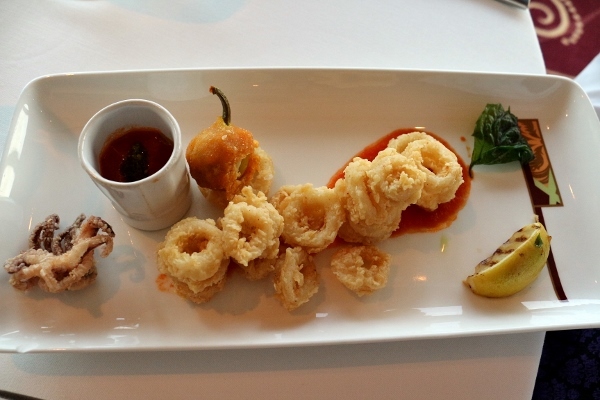 Another great option to start is the fritto di calamari, which is served piping hot alongside a fried cherry pepper. 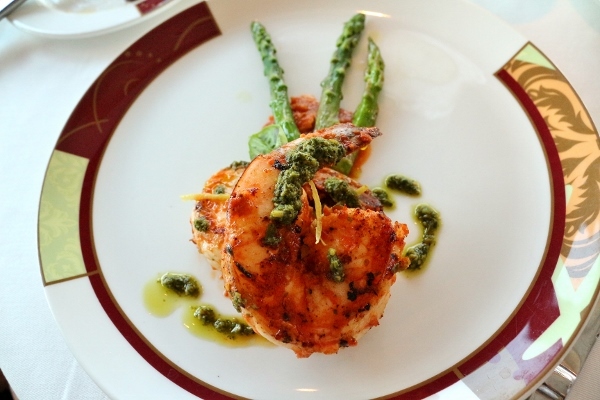 The Sicilian pesto marinated grilled shrimp is served over a mussel, crab, and cherry tomato ragu. 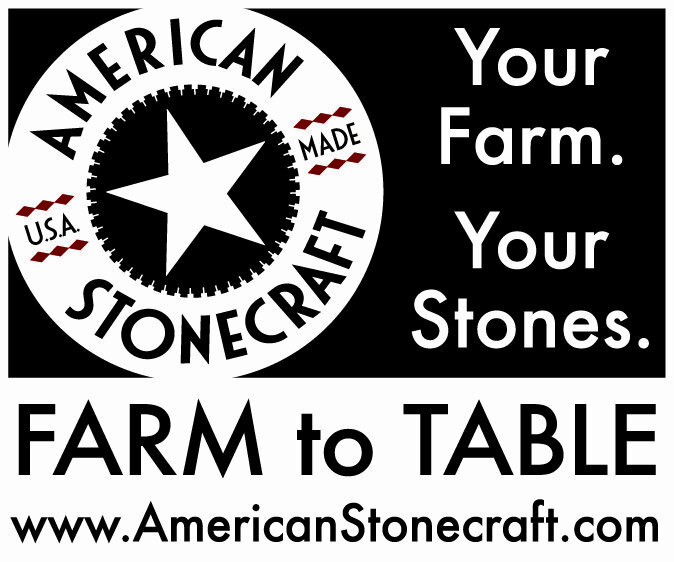 It's fresh, light, and fantastic! Onto the pastas! These were all shared so we each got to try a little variety of carbs. My favorite of the three pastas we tried is the Chianti braised beef ravioli "en bordo," tossed in a rich red wine reduction with roasted carrots and celery. Unctuous braised beef meets al dente pasta, and it's decadent! 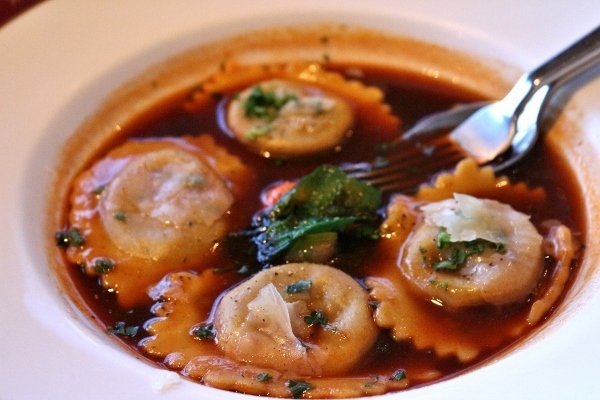 The ravioli themselves are toothsome, but add the rich umami sauce and it's so much more than a pasta course. 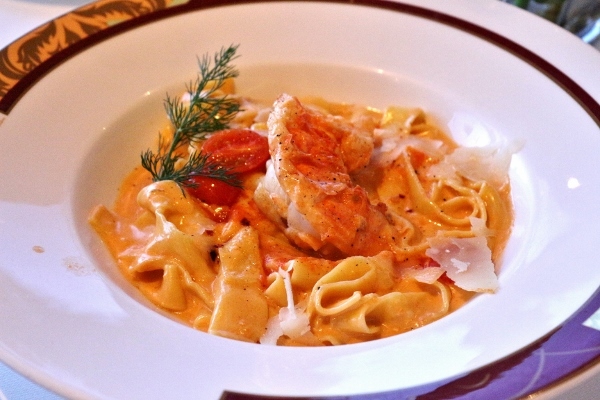 My second favorite pasta is the papparedelle con aragosta, which is long ribbons of pasta with lobster, fennel, chili, and fresh tomato sauce. The fresh papardelle and luscious lobster is a perfect pair. The sauce is fragrant, yet relatively light to really allow the lobster to shine. My third favorite (I don't want to say my least favorite, because I still loved it, just not as much as the others) is the lobster and mascarpone ravioli. This is served with burro bianco, the Italian equivalent of beurre blanc, or a white wine and butter sauce. 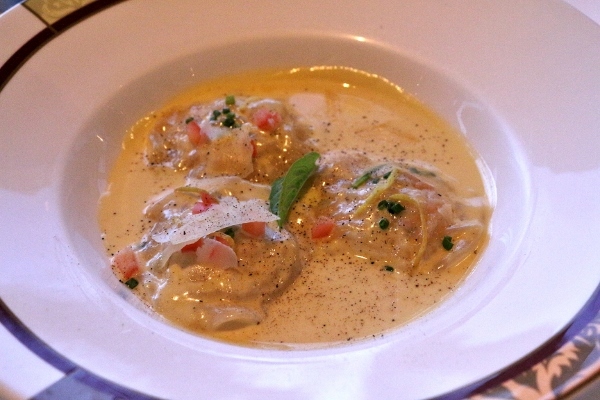 This ravioli was definitely richer than the other two pastas, and although it was excellent, it's a bit heavier and therefore especially great for sharing! 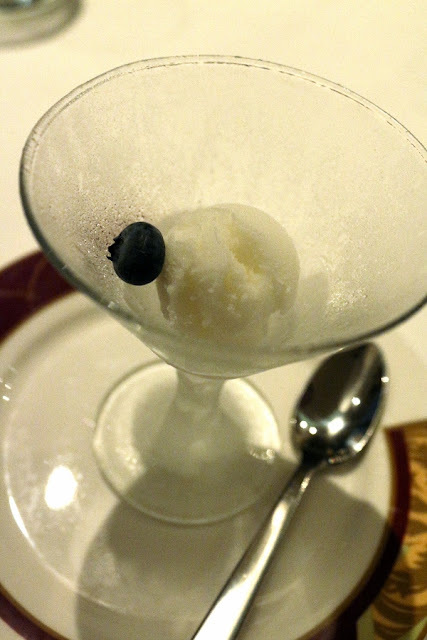 A lemon sorbet intermezzo is refreshing and cleanses the palate before diving into our entrees. Most of my dining companions selected the beef tenderloin "Palo," served with either Barolo red wine sauce or Gorgonzola sauce. This is definitely the most popular entree, and most likely what I would order on my next visit. 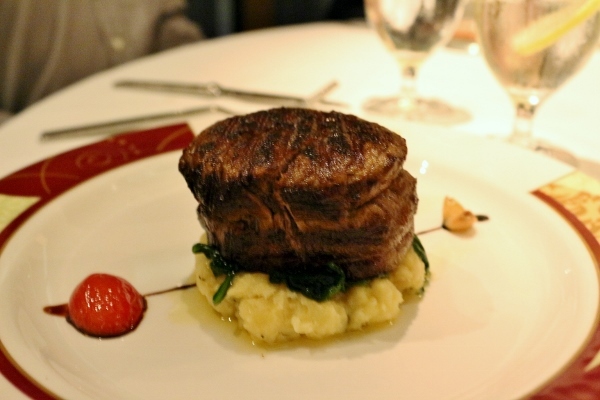 You really can't go wrong with a decadent, perfectly cooked piece of tenderloin. 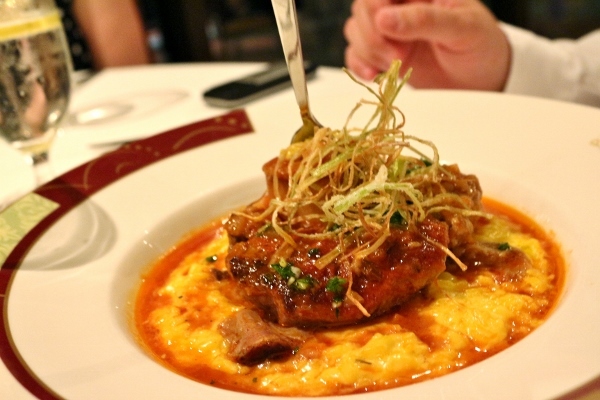 Another tablemate chose the fork-tender osso bucco, served with gremolata and risotto Milanese. I only tasted the bone marrow (yum! ), but heard plenty of swooning so I know this is also a great choice. Maybe I'll try this next time. Too many great choices! 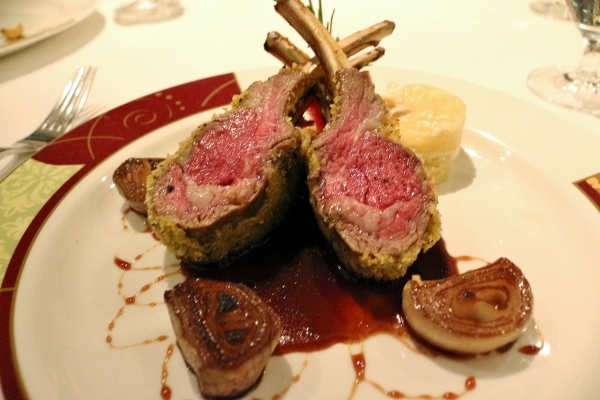 I personally selected the oregano and Parmesan crusted rack of lamb with Sangiovese roasted shallots, olive oil baked Roma tomatoes, potato torta and herb jus. The crust is delicious and the lamb cooked perfectly. I was actually pretty full by the time the lamb rolled around, but even after only plowing through about half of the plate, I can happily recommend this beautiful lamb dish. 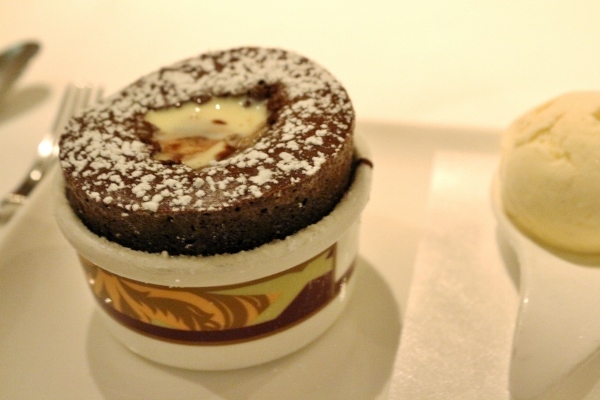 Palo is perhaps most famous for its decadent chocolate souffle, which must be ordered in advance, as it takes about 20 minutes to prepare. 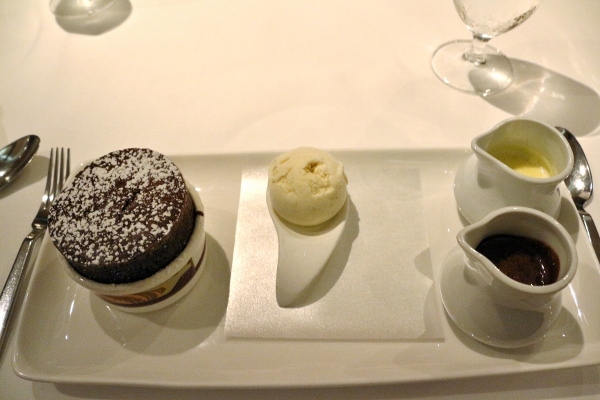 It's served with both creme Anglais and chocolate sauces. Every single person at our table indulged in this chocolate treat. A final flourish comes in the form of a small frozen cocktail served in a shot glass: Venetian sgroppino, which consists of lemon sorbet, Prosecco, and at Palo a splash of Calvados (apple brandy), whereas traditionally it's vodka. Fantastic! 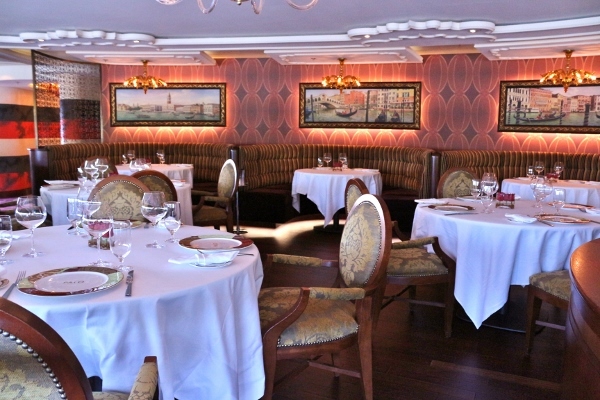 A meal at Palo is exceptional regardless of the time of day. 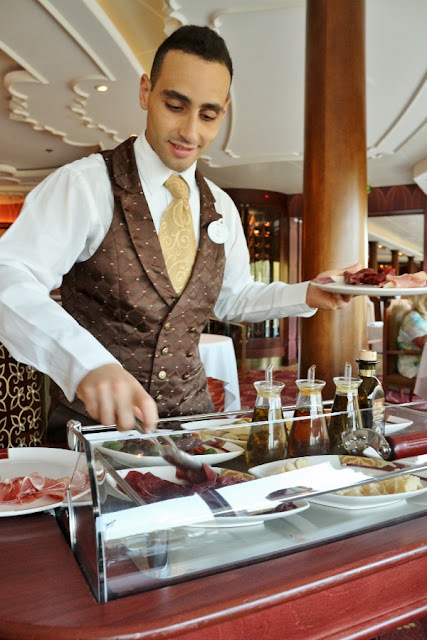 I'm a huge fan of both brunch and dinner at Palo and hope you will consider it if you're ever lucky enough to sail on the most magical cruise line in all the land (and sea), Disney Cruise Line.